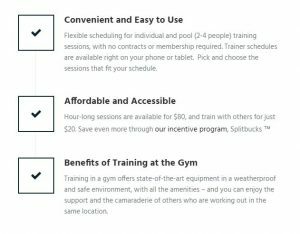 Personal training has become more affordable with the introduction of Splitfit, a new innovative peer-to-peer service that connects you directly to the fitness professionals. A one hour session costs only $20 when you join a pool of participants consisting of two to four individuals guided by a dedicated personal trainer. Also, every workout takes place in a reputable gym that’s been vetted by Splitfit for quality and safety. This is to ensure that you have access to the best gym equipment, a variety of amenities whether it be fresh towels or a juice bar, and an environment in which you can both be comfortable and share the fitness experience with fellow gym-goers. Splitfit allows you to set your schedule, so you choose when you want to work out, and where. Their network of available gyms includes the likes of One 2 One Bodyscapes, Beacon Hill Athletic Clubs, and BSC, fitness establishments that hold themselves to high standards, so you can rest assure you’re getting the best for the absolute minimum! Once you complete your fitness profile, which informs trainers of your goals and your activity level, you find a trainer whose training times matches your schedule. Then, you book your first session. And when you pay the full $20 to become part of a session’s pool before anyone else joins, you can earn up to $15 in Splitbucks when other customers join in after you. This credit can be used for future workouts. That’s $5 per person (up to three for a total of $15). Monthly memberships are nothing to worry about, and you just pay as you go. There’s virtually no commitment involved. Once your session is booked, you can attend that particular gym location several minutes, half an hour, an hour before your workout–whatever—or you can stick around after for as long as you’d like, so purchasing a day pass is not necessary.